Portable, Durable, Compatible with any kinds of Smart Device with USB Port. Selectec 24000 mAh huge power charges two digital devices at the highest speed simultaneously that is ready to go anywhere you do. It's the perfect partner whenever, and wherever you need to charge. 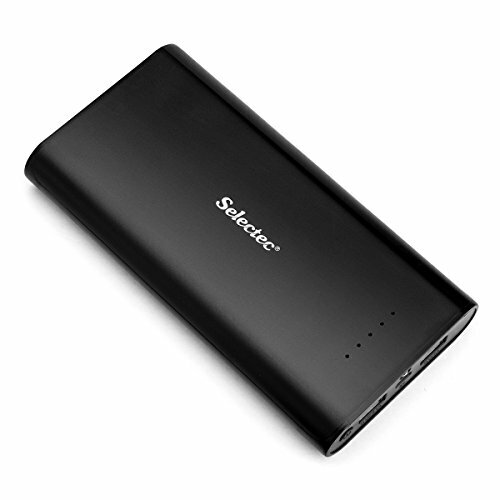 By intelligently identifying any connected device, Selectec 24000 mAh combines to ensure your devices charge at their fastest possible charge speed. Keep your devices charged on the go with dual USB charging ports. Equipped with built-in flashlight and LED battery indicators. Designed to work with all popular USB powered devices from iPhones to Android phones, tablets, photography gear, Bluetooth speakers, headphones, Digital Cameras, Game Consoles, Gamepad, MP3/MP4 Players, and more. Whatever USB powered gear you've got, we've got you covered. We offer hassle-free after-sale services: 30-Day money back guarantee, 360-Day warranty, Life-time technical supports. We always make customers 100% satisfied! Built in 5 LED Indicated Light will illuminate when a device is being charged. The flash light needs long press the power button to be turned on/off. Auto off after 10 seconds without operating power bank. Once receiving it, please kidnly check if battery has power left before charging. Grade A Li-Polymer cells, Huge capacity (24000mAh) power bank weighs a pound and charges an iPhone X / 8 above 8 times,iPhone 7 over 7 times, iPhone 6s up to 9 times, a Galaxy S9 Plus up to 6 times, or an iPad Mini more than 3 times.